A lot of people today may not remember the name Charles Whitman. 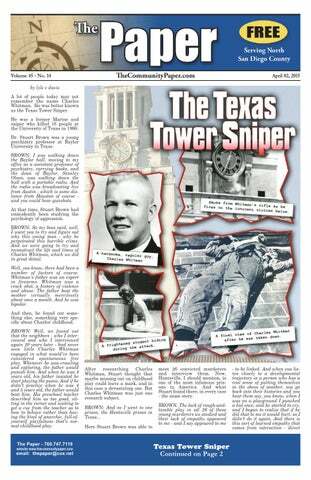 He was better known as the Texas Tower Sniper. He was a former Marine and sniper who killed 16 people at the University of Texas in 1966. Dr. Stuart Brown was a young psychiatry professor at Baylor University in Texas. BROWN: I was walking down the Baylor hall, moving to my office as a assistant professor of psychiatry, carrying books, and the dean of Baylor, Stanley Olson, was walking down the hall with a portable radio. And the radio was broadcasting live from Austin - which is some distance from Houston of course and you could hear gunshots. Smoke from Whit manâ&#x20AC;&#x2122;s rifle as fires on the in he nocent victims below. At that time, Stuart Brown had coincidently been studying the psychology of aggression. BROWN: So my boss said, well, I want you to try and figure out why this young man - why he perpetrated this horrible crime. And we were going to try and reconstruct the life and times of Charles Whitman, which we did in great detail. Well, you know, there had been a number of factors of course. Whitman's father was an expert in firearms. Whitman was a crack shot, a history of violence and abuse. The father beat the mother virtually mercilessly about once a month. And he was bipolar. And then, he found out something else, something very specific about Charles' childhood. After researching Charles Whitman, Stuart thought that maybe missing out on childhood play could leave a mark, and in this case a devastating one. But Charles Whitman was just one research subject. interaction - with others. For years after studying those murderers in Huntsville, Stuart continued to research the childhoods of people like them and like Charles Whitman, and in particular how a lack of play could have affected their brains. A man was sitting reading his papers when his wife hit him round the head with a frying pan. 'What was that for?' the man asked. odor-saturated collar, they're hardwired to flee and hide. But the non-players never come out. They die. The players slowly explore the environment and begin again to test things out. That says to me that play may be pretty important for our survival. A lawyer and a senior citizen are sitting next to each other on a long flight. The lawyer is thinking that seniors are so dumb that he could put one over on them easily. So, the lawyer asks if the senior would like to play a fun game. The senior is tired and just wants to take a nap, so he politely declines and tries to catch a few winks. The lawyer persists, saying that the game is a lot of fun, "I ask you a question, and if you don't know the answer, you pay me only $5.00. Then you ask me one, and if I don't know the answer, I will pay you $500." This catches the senior's attention and, to keep the lawyer quiet, he agrees to play the game. The lawyer asks the first question, "What's the distance from the Earth to the Moon?" a toy or on a birthday or on a vacation, and begin to build from the motion of that into how that connects with your life now. And you'll find you may change jobs, which has happened to a number of people when I've had them do this in order to be more empowered through their play, or you'll be able to enrich your life by prioritizing it and paying attention to it. Dr. Stuart Brown would later found and operate the National Institue for Play in California. He had found a common thread in the life stories of mass murderers: lack of play in childhood. After called back to active service because of poor academic performance, Whitman returned to the Marine Corps in 1963. In December 1964, he was discharged. Whitman went back to the University of Texas at Austin in the spring of 1965. Now, it's the senior's turn. He asks the lawyer, "What goes up a hill with three legs, and come down with four?" The lawyer uses his laptop to search all references he could find on the Net. He sends Emails to all the smart friends he knows; all to no avail. After an hour of searching, he finally gives up. He wakes the senior and hands him $500. The senior pockets the $500 and goes back to sleep. The lawyer is now going nuts not knowing the answer. He wakes the senior up and asks, "Well, so what goes up a hill with three legs and comes down with four?" mental health. The doctor recommended Whitman attend another session the following week, but he never returned. Suffering from mental illness and acute fits of anger, Whitman killed his mother and wife and on August 1, 1966, went atop a 300-foot tower, targeting people in the vicinity. He would kill 16 and injure many others before he was killed by police, who stormed the tower. Also in 1966, his mother finally left his father after suffering years of abuse. She got an apartment in Austin, not far from her son. This move would prove fatal for her. Sometime on the evening of July 31, Whitman went to his mother's home and stabbed and shot her. In a note left with her body, Whitman explained that he was "truly sorry that this was the only way I could see to relieve her sufferings but I think it was best." After killing his mother, Whitman went home. Sometime after his wife went to sleep, he stabbed her to death. He typed a note before her death, stating that he was going to kill her. He said that "I love her dearly. . . . I cannot rationally pinpoint any specific reason for doing this." "Oh," I replied, "so now you want me to stay!" ••••• If you think lawyers don't have hearts, read the best lawyer story of all time ... bar none. The United Way realized that it had never received a donation from the city's most successful lawyer. So a United Way volunteer paid the lawyer a visit in his lavish office. A trained sniper, Whitman shot most of his victims near or in the heart. In total, he killed 14 people and wounded 30 more on the campus before being shot and killed by two police officers, with a wide range of civilians assisting authorities during the crisis. In one of his writings, Whitman stated that he wanted his brain examined after his death to check for signs of physical cause of mental illness. His request was granted in the form of a police autopsy, which showed that he had a brain tumor. But medical experts disagreed over whether it had any effect on Whitman's actions. The day before the shootings, Whitman bought a pair of binoculars and a knife from a hardware store, and Spam from a 7Eleven convenience store. He picked up his wife from her summer job as a telephone operator, before meeting his mother for lunch at the Wyatt Cafeteria, located close to the university. At approximately 4:00 p.m. on July 31, Charles and Kathy Whitman visited their close friends John and Fran Morgan. They left the Morgans' apartment at 5:50 so that Kathy could get to her 6:00–10:00 p.m. shift. At 6:45, Whitman began typing his suicide note, a portion of which read: I do not quite understand what it is that compels me to type this letter. Perhaps it is to leave some vague reason for the actions I have recently performed. I do not really understand myself these days. I am supposed to be an average reasonable and intelligent young man. However, lately (I cannot recall when it started) I have been a victim of many unusual and irrational thoughts. Whitman wrote that he requested an autopsy be conducted upon his body, to determine if there was a biological reason for his actions and increasing headaches. He also wrote that he had decided to kill both his mother and wife. Expressing uncertainty about his reasons, he stated he wanted to relieve his wife and mother from the suffering of this world and to save them the embarrassment of his actions. He did not mention planning the attack at the university. Just after midnight on August 1, Whitman drove to his mother's apartment at 1212 Guadalupe Street. After killing his mother, he placed her body on her bed and covered it with sheets. His method of murder is disputed, but officials believed he rendered her unconscious before stabbing her in the heart. He left a handwritten note beside her body, which read in part: To Whom It May Concern: I have just taken my mother's life. I am very upset over having done it. However, I feel that if there is a heaven she is definitely there now [...] I am truly sorry [...] Let there be no doubt in your mind that I loved this woman with all my heart. Whitman then returned to his home at 906 Jewell Street, where he killed his wife by stabbing her three times in the heart as she slept. He covered her body with sheets, then resumed the typewritten note he had begun the previous evening. Using a ballpoint pen, he wrote at the side of the page: Friends interrupted. 8-1-66 Mon. 3:00 A.M. BOTH DEAD. Whitman continued the note, finishing it by pen: I imagine it appears that I brutally killed both of my loved ones. I was only trying to do a quick thorough job [...] If my life insurance policy is valid please pay off my debts [...] donate the rest anonymously to a mental health foundation. Maybe research can prevent further tragedies of this type [...] Give our dog to my in-laws. Tell them Kathy loved "Schocie" very much [...] If you can find in yourselves to grant my last wish, cremate me after the autopsy. He also left instructions in the rented house requesting that two rolls of camera film be developed. Whitman also wrote personal notes to each of his brothers. Whitman last wrote on an envelope labeled, 'Thoughts For the Day,' in which he stored a collection of written admonitions. He added on the outside of the envelope: 8-1-66. I never could quite make it. These thoughts are too much for me. shot and killed Eckman as he tried to help Wilson. He next shot Robert Boyer, a 33-year-old mathematician, who was killed instantly by a single shot to the lower back. After shooting Boyer, Whitman shot a 31-year old student named Devereau Huffman in the right arm; Huffman fell wounded beside a hedge. When Charlotte Darehshori, a young secretary, ran to help Boyer and Huffman, she came under fire. She crouched beneath the concrete base of a flagpole for an hour and a half, shielding herself from Whitman's view. Nearby, Whitman shot David Gunby, a 23-year-old electrical engineering student walking in the courtyard. Whitman fatally shot Thomas Ashton, a 22-year-old, in the chest. Next he shot Adrian and Brenda Littlefield as they walked onto the South Mall. Two young women, Nancy Harvey and Ellen Evganides, were wounded as they walked down the West Mall. Whitman shot Harvey, who was five months pregnant, in the hip, and Evganides in the leg and thigh. Both Harvey and her unborn child survived. Whitman began to fire upon people walking on Guadalupe Street; he shot and wounded 17year-old newspaper delivery boy Alex Hernandez, before fatally wounding 17-year-old Karen Griffith with a shot to the shoulder and lung. The next victim was a 24-year-old senior named Thomas Karr, whom Whitman fatally shot in the back as he walked to his residence after completing an exam. On the third block, Whitman shot and wounded 35-year-old basketball coach Billy Snowden from a distance of over 1,500 feet (460 m). Nearby, he shot 21-year-old Sandra Wilson in the chest. On the corner of 24th and Guadalupe, Whitman shot and wounded two students, Abdul Khashab and his fiancee Janet Paulos, outside a dress shop. Khashab, a 26-year-old chemistry student from Iraq, was shot in the elbow and Paulos in the chest. The next to be shot was a 21-year-old named Lana Phillips, whom Whitman wounded in the shoulder. Phillips' sister ran from cover to drag Lana to safety. it show that my brother, a disabled veteran, is blind and confined to a wheelchair and is unable to support his wife and six children?" The stricken United Way rep begins to stammer an apology, but is cut off again. "Third, did your research indicate to you that my sister's husband died in a dreadful car accident, leaving her penniless with a mortgage and three children, one of whom is disabled and another that has learning disabilities requiring an array of private tutors?" The humiliated United Way rep, completely beaten, says, "I'm so sorry. I had no idea." On Thursday, March 26, at about 10:10 pm, officers from the Escondido Police Department were dispatched to the area of Via Rancho Pkwy and Camino del Postigo regarding an injury collision involving a solo vehicle. Officers arrived on scene and found a silver Nissan 350Z had struck a concrete retaining wall and flipped onto its roof. Preliminary investigation indicates the driver, 33-year-old Eric Robert Anderson of Escondido, was driving westbound on Via Rancho Pkwy from the area of I-15 at a high rate of speed. It appears Anderson lost control of the vehicle and hit the retaining wall while in a sideways uncontrolled skid, with the impact causing the car to flip onto the roof. A warm welcome to Escondido Council Member Olga Diaz as today marks the first of what is hoped to be many “Memo from the Escondido City Council” columns. All council members have been invited to submit columns. So far, only Olga has chosen to accept our offer. The others are welcome . . . but if they choose not to . . . it may become the Olga Diaz report to the city of Escondido. That’s fine by us. As long as our readers have a chance to hear what’s going on in their city hall, we’re happy. You’ll find Olga’s premier column on Page 10 of today’s issue. On Saturday, March 28, at about 6:56 pm, officers from the Escondido Police Department were dispatched to the area of Lincoln Ave. and Fig St. regarding an injury collision involving a solo vehicle. Officers arrived on scene and found a blue Hyundai Accent had struck a light pole at the corner of the intersection. Preliminary investigation indicates the driver, 19 year-old Tiffany Kennedy of Escondido, was driving westbound on Lincoln Ave. at a high rate of speed. It appears Kennedy lost control of the vehicle and hit the light pole. Another doffing of the old fedorah to good friend, Clarke Dailey. Clarke is a headmaster at the Palomar Valley Christian Academy in Escondido, has been since 2012. In addition to being an educator, Clarke often puts on fundraising events for various nonprofits in the area. When he does those he asks for volunteers from his students and other teenagers. However, he winds up paying these “volunteers” an hourly wage (which they not only did not ask for nor expect) as well as usually taking them out for hamburgers and a soda afterwards. No wonder the kids and their parents worship the guy. A class act. ••••• To those of you who read this column and also dine at Charlie’s Restaurant in Escondido . . . we thank you for passing along our strong suggestion that Charlie let someone write a book about his life. It appears Mayor Sam Abed of Escondido may be in violation of several laws by having his campaign website be linked to the city of Escondido's Website. His dream led on to another discussion about dreams and their meaning. In the old country, the people had strong beliefs in dreams, visions, and fortune telling. Less here in America, but some beliefs still persist. And there may be something to them, who knows? I have very vivid, mostly pleasant dreams. An important fact missing from this article is that Ken Lounsbery was the Escondido City Attorney during the years that the Country Club, Golf Course, and surrounding homes were developed in an area that at that time and still to this day is zoned R1-7 on the zoning map of Escondido. It’s that time of year again! The Hidden Valley Kiwanis Foundation Charity Trout Derby is being held at Dixon Lake, Escondido on Saturday and Sunday April 25 and 26. The lake will be stocked with 3,000 pounds of Rainbow Trout with an average weight of 2 pounds with some up to 10 pounds. The Derby hours are 6 AM to 6PM on Saturday and 6AM to 4PM on Sunday. The entrance fee is $14 for adults and $10 for seniors over age 60 and kids 15 and under. You must be entered in the Derby to fish at the lake during the Derby. A California fishing license is not required to fish at Dixon Lake. Parking is $5. The Trout Derby Prizes come from Turner Outdoors and will be awarded in both Adult and Junior Divisions (age 15 and younger). The retail value of the prizes is approximately $1,600. One said to the other: "My 85th birthday yesterday. Wife gave me an SUV." Other guy: "Wow, that's amazing! Imagine, an SUV! What a great gift!" First guy: "Yup. … Socks, Underwear and Viagra!" ••••• An elementary dchool teacher had twenty-six students in her class. She presented each child in her classroom the 1st half of a well-known proverb and asked them to come up with the remainder of the proverb. It's hard to believe these were actually done by first graders. Their insight may surprise you. While reading, keep in mind that these are firstgraders, 6-year-olds, because the last one is a classic! 1. Don't change horses . . . until they stop running. 2. Strike while the bug is close. 3. It's always darkest before Daylight Saving Time. 4. Never underestimate the power of termites. 5. You can lead a horse to water but how? 6. Don't bite the hand that looks dirty. year-old male resident of San Marcos, was driving E/B on Hwy 78 going through the intersection at Broadway on a green light. The pedestrian, a white male approximately 35years-old, was walking S/B in the crosswalk against the red light. The driver of the truck did not see the pedestrian in time and was unable to avoid striking him. There were no passengers in the truck and alcohol was not a factor for the driver; the impairment and identification of the pedestrian is unknown at this time. The traffic investigation is ongoing and is being conducted by Officer Tom Venable of the Traffic Division. Anyone with information on this case is encouraged to call Officer Venable at the above phone number. To report any suspicious activities in your neighborhood, you may contact the Police Department directly, or the the Anonymous Tip Line at 760-743-TIPS (8477). cuted and convicted, could earn a four year term in prison plus substantial fines. It says: 424. (a) Each officer of this state, or of any county, city, town, or district of this state, and every other person charged with the receipt, safekeeping, transfer, or disbursement of public moneys, who either: 1. Without authority of law, appropriates the same, or any portion thereof, to his or her own use, or to the use of another; If convicted of the Government Code 8314 there could be fines of $1000 for each day the offense occurred plus a requirement for repayment of the value of public funds expended. come. Visit www.womansclubofvista.org or womansclubofvista@gmail.com for more info. Mark Shatz, Guitarist, to Perform at RB Woman’s Club Luncheon – Well-known throughout San Diego, Mark Shatz, guitarist, will perform at the Rancho Bernardo Woman’s Club luncheon on Thursday, April 9. Mark is know for his entertaining ability to perform an extensive repertoire of many genres. The luncheon will be held at the Rancho Bernardo Inn, 17550 Bernardo Oaks. Social time is at 11:30am; lunch served at 12noon. Cost is $26/all inclusive. Guests are welcome. Call Fern at 760.741.6620 for reservations. For info about the Club or becoming a member, contact Jan at 858.487.6942 or Diana at 858.484.8958.
www.socialsecurity.gov/myaccount. Networking starts at 6pm; dinner at 6:30 and the speaker from 7:15-8pm, at The Old Spaghetti Factory, 111 N. Twin Oaks Valley Rd, San Marcos. Cost is $23/members and $28/guests. RSVP to Sue at 760.822.2242. Section 81002 recites the public policy applicable to campaign disclosures and declares "Receipts and expenditures in election campaigns should be fully and truthfully disclosed in order that the voters may be fully informed and improper practices may be inhibited." [90 Cal.App.3d 129] To accomplish this purpose, section 84200 et seq require all candidates and committees supporting or opposing candidates and ballot measures to file periodic campaign disclosure statements. The act also requires records to be kept (§ 84100), prohibits anonymous and cash contributions (§§ 84300, 84304), and regulates payments by agents and intermediaries (§§ 84302, 84303). to Meet on April 9th – at the North Coast Church (The Edge Building), 2405 N. Santa Fe, Vista. Doors open at 9am. The program speaker will be Mary Lou Weidman and her topic is “Out of the Box.” The Workshop 2 Day is “Hoidy Toidy Houses. For more information, visit the El Camino Quilt Guild website or info@elcaminoquilters.com. Members, wear your nametag for free door prize drawing ticket. Guest fee $5/person. Snacks and café on site; parking available. Recent news about California’s high-speed rail project is raising more questions. Construction on the initial 29-mile link between Fresno and Merced, now two years behind schedule, was rescheduled to begin this March, but has now been delayed several more months. These delays have resulted in huge costs for the contractor, who may sue. Voters approved Proposition 1A in 2008, which authorized a $9.95 billion bond to help finance what was described as a $40 billion high-speed rail system, a projection that has now escalated to at least $68 billion and will likely go far higher. Camino Country Club in Oceanside. Following a 9:30 breakfast buffet, Carol Oakley Jackson, California DAR State Regent, will present a program “Gift of Life: Organ Donation.” Mrs. Jackson has had personal experience with this subject as her husband has had both a liver and a kidney transplant. Visit http//santamargarita.californiadar.o rg. CSUSM Theatre Presents “Twilight, Los Angeles: 1992” – The theatre program at California State University San Marcos (CSUSM) will present a play by award-winning playwright and actress Anna Deavere Smith, April 10th to 19th. “Twilight” is the result of nearly 300 interviews Smith conducted in a nine-month span following the Rodney King riots in 1992. Four performances will be followed by panel discussions with faculty experts and community leaders to allow further discussions on the topics of social justice, art, education, law, and faith. The performances will be held at the Performance Hall, Arts Building, Room 111, on Friday, April 10, 7pm, followed by Audience Talk Back panel discussion on arts and social justice. On Saturday, April 11, 2pm, Audience Talk Back on education and social justice. On Saturday, April 11, 7pm, Audience Talk Back on law and social justice. Friday, April 17, 7pm; Saturday, April 18, 2pm and 7pm. On Sunday, April 19, 2pm, Audience Talk Back on faith and social justice. Tickets are $5 and available for purchase at the door or online at www.csusm.edu. line. To meet this deadline, the project will be forced to spend around $6 million per day for a full fiscal year beginning in July, a staggering amount that far exceeds spending for any known past project. Unfortunately, despite growing opposition from legislators and from the public at large, plans to forge ahead with highspeed rail are progressing. California has many pressing needs, including costly upgrades for its highways, its water infrastructure, a seriously underfunded Medi-Cal reimbursement program, and unfunded mandates in excess of $300 billion. Continuing to fund an expensive rail project with doubtful finances that few would ever use is sheer folly. Since good stewardship of the people’s tax dollars is absolutely essential in a representative republic, this costly boondoggle must be sidetracked, sooner rather than later. world are encouraged to serve together on Kiwanis One Day. This year Kiwanis One Day is Saturday, April 11—so mark your calendars and encourage your Key Clubbers to start planning a project! The goal of Kiwanis One Day is to team up with as many members of the Kiwanis family as possible to work on a service project. There are no rules or restrictions, so be creative! Encourage your club members to reach out to community members as well as local members of the following clubs: Kiwanis, K-Kids, Builders Club, Circle K and Aktion Clubs, and have a wonderful, fun, and productive day! CicloVia Escondido – is a free public event that promotes active living and a healthy community. It is an open street event (closed to auto traffic) and people participate by walking, bicycling, dancing, playing, and socializing. It will be on Grand Avenue between Escondido Blvd, and Juniper Street, on Saturday, April 11, from 10-am-3pm. Show your support for local businesses and active living. Teach your child how to bicycle; learn about health and wellness; shop local retailers; walk or stroll leisurely. The event has been made possible by County of San Diego and Escondido Chamber of Commerce, and sponsored by DecoBike. For more info, visit www.cicloviaescondido.com. San Diego. The program will include a presentation by Jeanen Monteleone on Runes, an ancient lettering alphabet in use over 2000 years ago by Germanic and Scandinavian cultures, and she will explain possible ways to translate, read and write using Runes. There will be hands-on projects in card making and origami as backgrounds for writing Runes for fun. All skill levels are welcome to attend. Earth Day Festival at Alta Vista Botanical Gardens - All are welcome to the FREE Earth Day Festival, a fun day for children and families, at Alta Vista Botanical Gardens on Saturday, April 11, from 10am to 3pm. Activities for children will include Earth Day ROCKS!, interactive educational displays, creative crafts, facepainting, games and relays, planting for nutrition, a cotton spinning demo, worms and compost, music, and the Rancho Folklorico dancers. A big plant sale will include colorful nursery plants, and food will be available for purchase. Vendors will display and sell a variety of wares and crafts. Creative healing with vendors, exhibitors and music will be offered as well as yoga. Alta Vista Gardens is located at 1270 Vale Terrace, at the top of the hill at Brengle Terrace Park. For more info, visit the website altavistagardens.org or email info@altavistagardens.org. CSUSM Celebrates 25th Anniversary with Open House, April 11 - In celebration of the University’s 25th anniversary, California State University San Marcos will welcome the region to Discover CSUSM Day on Saturday, April 11, from 8am to 7pm. This free, day-long open house is the perfect way for prospective students, families and anyone else interested in learning about CSUSM to tour the campus and residence halls, meet the faculty, talk with current students about their college experience and learn more about Cal State San Marcos. Entertainment, programs, games and hands-on activities for all ages are planned. Cheer on the baseball team or collegiate men’s and women’s track and field teams from around the state; view the sun through a solar telescope; visit labs, watch musical performances, paint a mural, listen to lectures, and more; and groove to the beat at a concert by Energy 103.7 featuring Tristan D and DJ Ideal. Online registration is encouraged for prospective and admitted students; walk-ins are invited. Register by April 3 at http://www.csusm.edu/explore/discover-csusm/RSVP.html. CSUSM is located at 333 S. Twin Oaks Valley Road, San Marcos. Parking is free in all general lots. More info is available at www.csusm.edu/25. impossible. 8. A miss is as good as a Mr. 9. You can't teach an old dog new math. 10. If you lie down with dogs, you'll stink in the morning. 11. Love all, trust me. 12. The pen is mightier than the pigs. 13. An idle mind is the best way to relax. 14. Where there's smoke there's pollution. 15. Happy the bride who gets all the presents. 16. A penny saved is not much. 17. Two's company, three's the Musketeers. 19. Laugh and the whole world laughs with you, cry and you have to blow your nose. 20. There are none so blind as Stevie Wonder. An elderly Floridian called 911 on her cell phone to report that her car has been broken into. She is hysterical as she explains her situation to the dispatcher: 'They've stolen the stereo, the steering wheel, the brake pedal and even the accelerator!' she cried.. The dispatcher said, 'Stay calm... An officer is on the way.' A few minutes later, the officer radios in 'Disregard.' He says. 'She got in the back-seat by mistake.' Subscribe to The Paper! to three separate vendors – a barrel maker (blacksmith), a carpenter who carved the gun stock, and a maker of “flint locks” (the mechanism that includes the firing hammer and the lock that ignites the gun power to fire the weapon). Self-assembly was required. As for Kit and Kaboodle, that source is unknown. To play “Cat and Mouse” with someone comes from early 20th century England when Parliament passed a law called the “Prisoners Discharge For Ill-Health Act.” It promptly became known as the “Cat & Mouse Act.” Hunger strikers would be released from prison because of ill-health, but could be re-arrested when they recovered. Indian Giver: With the history of our nation regarding our illtreatment of Native Americans, this term is selfexplanatory. Sound Home Solutions is an authorized dealer for Sony, Samsung, LG, Yamaha, Denon, Polk and many other Audio/Video Products. We will meet or beat any retail or online distributor and if something was to go wrong with the product, we will service it for you which eliminates returns headaches. In seafaring folklore, “Davy Jones’ Locker,” refers to a sailor’s hell beneath the sea. The verbiage comes from a book, “The Adventures of Peregrine Pickle,” written in 1751, by Tobias Smollett. In Chapter XIII, Peregrine and two fellow sailors attempt to frighten Commodore Trinnion by a dreaded ghost, which the trio had concocted. It worked so well that Trinnion was frightened one evening by exclaiming: “I’ll be damned if it wasn’t Davy Jones himself! I know him by his huge saucer eyes, his three rows of teeth and tail and the blue smoke that came out of his nostrils.” According to seafaring mythology, Davy Jones sits on the rigging during hurricanes and storms warning of death and disaster. To call someone “Mad as a Hatter,” refers to a person not in their right mind, but did that term come from Lewis Carroll’s 1865 book “Alice in Wonderland?” No. it was used long before Carroll’s book. Hat makers used mercury in manufacturing headwear. After years of toiling in a hat factory, workers would often become mentally ill from mercury poisoning. The term was used to describe one of Carroll’s main characters. It’s so cold it could "Freeze the Balls Off a Brass Monkey” is a sailing warship term, contrary to those in modern times who try to make it an indecent remark. Sailing warships of the 16th through 19th centuries were armed with cannons. Alongside each cannon were brass platforms, known as “monkeys,” holding stacks of cannon balls, making them conveniently available for gunners mates to grab them quickly to reload. With this explanation, during cold weather, the saying is self-explanatory. "To Burn One's Bridges" comes from the days of Caesar. When he would invade a country to conquer it, Caesar would burn all bridges his armies used to cross into the foreign territory. To Caesar, retreat was not an option. The burning of bridges was an incentive used for his officers and soldiers, giving them no alternative but to push ahead and conquer the enemy. There are hundreds more, but if you have a favorite, drop a letter to me here at The Paper, or send me an e-mail: quotetaker@msn.com. scream as the bullet hit him in the wrist; the youth saw shrapnel from the shot had embedded into his own left arm. Ehlke was shot in the left biceps before he dove for cover. Ehlke emerged from cover to drag his friend to safety and was shot again in the leg. A 64-year-old local shopkeeper named Homer Kelly helped drag the wounded duo— plus Herman—into his shop, before he was shot and wounded in the leg. To the rear of the intersection of 24th and Guadalupe Street, Whitman targeted two 21-yearolds, Oscar Royvela and Irma Garcia, as the pair walked toward the university's biology laboratory. Shot first, Garcia later said the bullet spun her "completely around" and she fell to the ground. Royvela tried to help Garcia when he was shot through the shoulder blade; the bullet exited through his left arm. Students Jack Stephens and Jack Pennington ran from cover and dragged the pair to safety. Whitman targeted a 26year-old carpenter named Avelino Esparza and seriously wounded him in the left shoulder. Directly in front of the entrance to the West Mall on Guadalupe Street, two 18-year-old students named Paul Sonntag and Claudia Rutt had taken refuge behind a construction barricade alongside teenager Carla Sue Wheeler. Whitman started shooting in that direction and hit Sonntag in the mouth, killing him instantly. Sonntag's body fell against a parking meter and knocked the barricade slightly open. Rutt tried to reach Sonntag while Wheeler restrained her; Whitman shot a bullet that took three fingers of Wheeler's left hand, and hit Rutt in the chest. Rutt died later in hospital; Wheeler survived. A block north of where Sonntag and Rutt were killed, Whitman shot and killed Harry Walchuk, a 38-year-old doctoral student and father of six. He next shot the 36-year-old press reporter Robert Heard in the arm as Heard ran toward two highway patrolmen coming on the scene. Slightly north, 18-year-old freshman John Allen was wounded in the forearm as he and acquaintances looked toward the tower from the University of Texas Union. tion are provided for the class but participants are encouraged to bring their own handgun if they already own one. The Escondido Fish and Game shooting range is located at 16525 Guejito Road and Lake Wohlford Road. Cost is $60.00. To register for the class, call Jack at 7607462868. RB Chorale is Offering Applications for Scholarships – If you are a high school graduating senior planning to further your education in the musical performance arts, the RB Chorale has applications for scholarships. The program is open to all San Diego County high school seniors who plan to further their education in any field of music, including voice, string, wind, percussion (no combos), or any other solo instrument. Applications for the Scholarship program must be postmarked no later than and will be accepted through April 11th and those who qualify will audition in front of the Chorale Board and an esteemed panel of judges on May 2nd in the Studio West recording studios in Rancho Bernardo. An application form and further information is available on the Chorale’s website www.rbchorale.org, or contact Keith Cheney, Scholarship Chair at 858.748.1273. Place your application and required information in a binder/cover folder and mail to The RB Chorale, Inc., Edward Berger, President, P.O. Box 28818, San Diego, CA 92198. Save the dates of June 13 and 14 for the next show “The RB Chorale Goes to Broadway” at the Poway Center for Performing Arts. The show will feature performances by this year’s scholarship finalists and the awarding of $10,000. Tickets go on sale in mid-May and will be available through members and the website. Strawberry Festival at S.M. Farmers Market – On Sunday, April 12, from 11am-3pm, kick off Spring with "Everything Strawberry" at the San Marcos Farmers Market. Sample strawberry delights including fudge, smoothies, granola, chocolate strawberries and, of course, this season's best fresh, local strawberries. Fun for the whole family includes a Strawberry Scavenger Hunt with prizes for all ages. Live music by reggae big band "Sol Remedy" will play all day. The farmers market has over 30 vendors every week including fresh local and organic produce, cut flowers, raw honey, eggs, dried fruit, almonds, peanuts, and juice. handcrafted jewelry, cosmetics, hats, and homestyle gourmet foods such as hummus, sauces, pickles and pantry goods round out the array of items available. For more information, contact the San Diego Farm Bureau's farmers market manager Christy Johnson at 760.580.0116 or christy@sdfarmbureau.org. Home Firearm Safety/Basic Handgun Class - On Sunday, April 12th, a monthly 3-hour familiarization and safety class is offered for anyone anticipating the purchase of, or who already owns, a handgun. Pianists to Dedicate Grand Piano at VC Library - The Valley Center Branch Library has accepted the donation of a grand piano, and four pianists will perform at a dedication concert on Sunday, April 12. The program begins at 2pm in the Library Community Room. Admission is free and tickets are not required. The event is sponsored by Friends of the Valley Center Library which set out to find someone who would donate a piano to replace a vintage spinet. Offers were received from owners of 29 pianos. Instead of a baby grand, the search committee wound up with full-size grand piano. The donor of the piano is Julie Watkins of San Marcos, who will be recognized at the concert. The four pianists, who will perform an hourlong program of classical and standard music, are Sydney Circle, Laurie Johnson, Mike Klingbeil and George Vickrey, all Valley Center residents. The newly-acquired instrument was manufactured in Europe by Bechstein which, along with Steinway, was founded in 1853. Both companies are still in business. For more information, visit www.vcfol.org or call 760.749.1305. The library is located at 29200 Cole Grade Road. Food Truck and Family Festival for Abraxas High School – Part of the Poway Unified School District, Abraxas High School is very special to The Church of Rancho Bernardo. For several years the church has partnered with this at-risk youth high school to help them with school improvements, painting projects, mentoring for the students and their every day school and student needs. Sunday, April 12th is another such day. From 10am to 1:30pm, you are invited to the church to pack a backpack for an Abraxas student or a tote for an Abraxas teacher with much needed school supplies. For a $10 donation you can pack a backpack, and for a $25 donation you can pack a teacher tote. You can then write a card to the student or teacher that will go into the bag that you just packed with their supplies. This is a family-fun day for the whole family; a bouncy house, obstacle course; four food trucks (GreenGo Grilled Cheese Gastro truck, Stuffed, Dos Banditos Taco truck; and Wickedly Awesome Ice Cream truck) where you can buy some crazy-good eats, and more. For details and info, contact Nate Alcorn/Impact-Outreach Director, at Nathan@thechurchrb.org or 858.592.2434, ext. 317. The church is located at 11740 Bernardo Plaza Ct., San Diego, 92128. A Weekly Memo from the Councilmembers of Your Community published in the belief that it is important for elected leaders to communicate with their constituents and that constituents have a means of hearing from their elected leaders. dent lies beside a hedge. lance driver named Morris Hohmann was shot in the leg on West 23rd Street as he tried to evacuate the numerous wounded. The wound severed a major artery. A fellow ambulance driver gave him first aid before he was taken to Brackenridge Hospital, the only one with a local emergency room. The Brackenridge Hospital administrator declared a state of emergency. Medical staff raced there to reinforce the on-duty shifts. planned equestrian facilities. It truly takes a community to support and maintain over four thousand acres of land spread throughout the City. All parks, large and small, should have a “friends” group to augment City maintenance. Make time to support your neighborhood park. Join an existing “friends” group, or start one for your park with neighbors. It’s a great way to give back to your community while enjoying our treasured public resources. Numerous volunteers donated blood at both Brackenridge Hospital and the Travis County Blood Bank. The Pastor Says . . .
ground and often buried a favorite bow or other weapon with the deceased to be used in the next life. The ancient Greeks had Charon, the boatman, to ferry the dead, for a fee, across the river Styx. Cupcake is the pet of the week at your Rancho Coastal Humane Society. She’s a 1 year old, 34 pound, Blonde, Labrador Retriever mix. In many ways, Cupcake it still a puppy. But since she’s one year old she knows how to walk on a leash. She has her adult teeth. And it won’t take her long to bond with her new family. Cupcake was transferred to Rancho Coastal Humane Society from a Mississippi animal sanctuary through the Friends of County Animal Shelters program. The $145 adoption fee for Cupcake includes medical exam, vaccinations, neuter and microchip. Visit Rancho Coastal Humane Society at 389 Requeza Street in Encinitas or log on to SDpets.org. Call 760-753-6413 for more information. Kennels and Cattery open 11 AM to 5 PM every day but Tuesday. Abby, a 4-year-old Abyssinian, is a beautiful kitty looking for a gentle, loving home. She was extremely shy when she first entered our care, but after spending some time in foster care, she feels much more confident and outgoing around her human companions. Give her space to approach you on her own terms, and she is well worth the wait! Abby is a very affectionate little kitty. She loves to greet her foster mom at the door and ask for some much-needed petting. She absolutely loves treats and will gently eat them right out of your hand. Abby’s favorite activity is playing with string toys. She gets along well with other cats and loves to snuggle close. Abby is available for adoption at San Diego Humane Society’s Escondido Campus located at 3450 East Valley Parkway. To learn more about making her part of your family, please call (760) 888-2275. Last month I wrote about dying and the need to prepare for death. This month is a natural to write about life beyond this world because of Easter, the traditional day of Jesus’ resurrection, and what that has meant for millions of people since then, as well as today. Christianity, a religion founded in the first century, claimed that the person, Jesus Christ, arose from the dead with a physical-spiritual body and taught that all who believed in his life giving power would also be resurrected with the same kind of body for all eternity. Many, in the same religion, believe that all human beings will be resurrected and their ultimate disposition will be determined by belief and deeds. So is there life beyond the grave? It has long been a hope. Yet, until one dies he or she will not know, in spite of the claims of those who purport to have been there, that there really is an afterlife. Nor will we know for sure with all the Easter services, chocolate bunnies, colored eggs, and new clothes. We will have to wait until ----------------. A Weekly Message from the Mayor of Your Community published in the belief that it is important for elected leaders to communicate with their constituents and that constituents have a means of hearing from their elected leaders. The City of San Marcos presents its annual holiday breakfast and egg scramble on Saturday, April 4 at Walnut Grove Park, 1950 Sycamore Drive, San Marcos, 92069. “Breakfast with Peter Cottontail” will be held inside the Williams Barn in Walnut Grove Park from 8 to 10 am. Prepared by the Life and Eagle Scouts Troop 649, tickets for the early morning breakfast of pancakes and eggs can be purchased at the door for $5 adults, $4 youth-10 and under. Immediately following the breakfast at 10:15 am sharp, toddlers through 5th graders are invited to the community “Holiday Egg Scramble” where prize-filled eggs will be scattered throughout the park. Participants should arrive at the park by 9:45 am. Every child who recycles eggs will receive a special prize. Families are encouraged to come early and enjoy carnival games and party jumps. Each child should bring a bag or basket. Suggested donation is $5 per family. For more information, please call (760) 744-9000 or visit www.san-marcos.net. duty officers, Travis County Sheriff's deputies, and Texas Department of Public Safety troopers also converged on the area. Approximately 20 minutes after first shooting from the observation deck, Whitman began to encounter return fire from both the police and other armed citizens. One Texas Ranger used a student as spotter to help locate the sniper. At this point, Whitman chose to fire through waterspouts located on each side of the tower walls. This action argely protected him from gunfire below, but limited his range of targets. Police sharpshooter Marion Lee reported from a small airplane that he had observed a single sniper firing from the observation deck. Lee tried to shoot Whitman from the plane, but the turbulence proved too great. Whitman shot at the plane, and it moved off to circle from a greater distance. Three officers who responded to reports of the sniper were Ramiro Martinez, Houston McCoy and Jerry Day. Prior to advancing upon the tower, McCoy had seen his colleague Billy Speed killed. Both Martinez and Day had driven to the University of Texas after listening to radio reports. toward the tower—they were the first to reach the tower's observation deck. After reaching the 26th floor by elevator, they encountered M. J. Gabour. Gabour—clutching his wife's shoes— screamed that his family had been shot and tried to wrestle the rifle from Day to shoot Whitman himself. Day consoled Gabour and led him to safety before joining McCoy, Crum and Martinez as they walked up to the 27th floor. Beneath the stairwell leading to the reception area, Officer Martinez saw the body of a teenage boy, Mark Gabour. Next to him lay a middle-aged woman, Marguerite Lamport. Nearby, Mike Gabour lay slumped against the wall, with his mother lying face down in a pool of blood. The officers turned Mary Gabour onto her side to prevent her from drowning in her own blood. Mike Gabour gestured to the observation deck and said, "He's out there. Who actually killed Whitman is in dispute. Legends die hard in Texas, and so the truth may never be known about who really killed Charles Whitman on top of the University of Texas tower here nearly three decades ago. Was it Officer Ramiro Martinez, showered with national acclaim as a true Texas hero, who rode that fame in a 20-year career with the fabled Texas Rangers and was lionized in a made-forTV movie? levels. Register soon (760.940.WAVE), as the classes fill up quickly. Browse the City’s web site at any time to check park sites, programs and activities managed by our Recreation & Community Services Department. Sign up for e-newsletters from the department or view the online calendar of events and programs on the City’s main page at cityofvista.com. On a safety note, please keep in mind that the spring weather means more pedestrians and bicycles – especially children – are on our streets. Remember to please be aware of the space around you and to drive carefully. Come out and enjoy two fun filled events sponsored by Friends of the Oceanside Public Library. Or was it Officer Houston McCoy, a lanky, slow-moving drifter who eventually left police work and took a twisted trail that has left him drunk, broke and divorced? "I'm a west Texas cowboy and west Texas cowboys don't normally open their mouths," McCoy said the other day, after all these years coming forth to claim, with a good deal of proof, that he is the real hero. The important thing is, Charles Whitman was finally shot and killed. The rampage lasted less than two hours with most of the deaths and injuries occurring in the first 15 to 20 minutes. versity Masters’ program, playing in the style of the great Django Reinhardt and putting a creative twist on gypsy jazz by highlighting the uniqueness of the music in interesting ways. On April 17th in the same location, Rebecca Martin, a professional storyteller and entertainer for over a decade, will tell vibrant stories with animated delivery Rebecca reaches the hearts of children ages 0-5 while developing imagination and communicating abilities. Her interactive and sparkling style is sure to delight all participants and the event is free! For more information regarding these and other Friends of the Library events, please call 760-435-5600.
father and the denial of playing with his neighbor kids mold his brain and mind into that of a mass killer? And did the fact that 28 other murderer’s at the Alabama all revealed identical restraint of play lend credence to the thesis? I don’t know about you, but as for me, I intend to play. A lot. The Paper • Page 12 • April 02, 2015 The two men turned around and stared at him. “Why not?” asked the first man. “Because they will always break your heart,” he said softly. “The Padres will break my heart?” scoffed the second man. “Yes” said the dark man, “and not just the Padres. The Chargers, USD, UCSD and San Diego State, they will all break your heart. It cannot be changed, it’s The Curse” He waved goodnight to Amanda, the bartender, and continued toward the door. “You don’t really believe in The Curse do you Amanda?” snorted the first man. time Pop..let’s stop talking about it and just do it! Pat: We are going to this time…I have the means to be serious about it now.” Me: Because of the reverse? Pat: Yep…I am very glad I took your advice son and just did it. It has been a game-changer.” Me: Well, even an old dog can learn a new trick. Pat: Who you calling old? (He whacks me on the head and laughs again) In our next column, I will discuss using a mortgage refinance for debt-consolidation. This is becoming prevalent again as more and more people use credit cards to survive in our volatile economy. As always, contact me anytime with any questions or to check interest rates…there is never a charge or obligation. Need Promotional Items? The Paper Will Help! Parks is an expert in promotion items, golf items, cups, pens, calendars, flashlights... you name it - he’s either got it or will get it... and at a price that will dazzle you! Low, low prices, top, top quality! 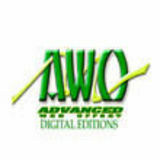 Contact The Paper for your promotional needs! Specializing in short and long term care assistance for all ages, with all activities of daily living, in your home. Drive to/from doctor appointments, new mommy assistance/infant care, Alzheimer patient care, general assistance before/after surgery, respite care for parents of disabled children, and much more. Rates start at $16.00 per hour for companion services. Call 800.783.3127 or 760.424.2400 24 hours/day 7 days/week. THANK YOU mucho Ms. Madison; absolutely wonderful to see that really nice article with picture of the band on page 6 of the March 19th edition of THE PAPER. One of the good guys . . . Pastor Sam Brumit from Mission 316 Church in San Marcos, dons facepaint “tattoos” at a celebraton at his church for kids and their families ... all this past Sunday. His church is growing as is his Kid’s Unlimited Club. Popcorn Remover -Texture Wallpaper removal - Crown Molding Wooden Floor Installation - Mobile Home Painting - Low Price Guaranteed! Sorry! No Small Jobs! Mary Von Wilda, 90, of San Marcos, CA., passed away on March 27, 2015. Raymond Franklyn Jones, 92, of Escondido, CA., passed away on Mardh 29, 2015. Call 760.752.3030 Free Advice www.soundproofing.org 455 East Carmel St. San Marcos, CA. Ruth Robin, 77, of Escondido, CA., passed away on March 29, 2015. Research and Scholarship Fund of Brandeis University, Waltham, MA. 2nd Tuesday Book Club on April 14 at Escondido Library – Adult readers are invited to join the 2nd Tuesday Book Club meeting on Tuesday, April 14, at 6pm in the Turrentine Room of the Library, 239 So. Kalmia St., Escondido. This month’s selection is “Catherine the Great: Portrait of a Woman” by Robert K. Massie. Massie relates the life of a minor German princess, Sophia of Anhalt-Zerbst, who became Empress Catherine II of Russia (1721796). All library programs are free to the public. For more information about the 2nd Tuesday Book Club and National Library Month events, visit library.escondido.org or contact Neva Robinson at 760.839.4214 or nrobinson@escondido.org. You have questions about your financial path. We are the right people to answer those questions. Letters to the Editor? We Love ‘em! www.donnadavisrealtor.com The finest compliment I can ever receive is a referral from my friends and clients. Lic#: 0803847 Ins. 60805 - Reg. No Excuses! We Get It Sold! 48 Million Americans Suffer From Hearing Loss. Don’t let hearing loss stop you from enjoying life. Call us! We can help! Identify him and you will be recognized in next week’s issue of The Paper. Once again, Barbara Turrentine solved our mystery guest photo from last week. As she says, “Dr. Stephen Heilman - next week give us a real difficult one..” Barb was followed by Randy Hartsock, Dr. Gretchen F. Buehl and Dr. Roy "Pat" Archer. Dr. Stephen Heilman, below, is a long time advertiser with The Paper, and is a brilliant young chiropractor. CPR for Family & Friends; Preparation for Childbirth: In a Weekend; Preparation for Childbirth: 5-Week Series; Thyroid & Parathyroid Issues; Sleep Health; Getting Ready for Pregnancy; Heartsaver First Aid; Baby-Care Basics; Becoming a Young Woman; Meditation Made East: 8-Week Series; and Relaxation for Labor. STATEMENT OF WITHDRAWAL FROM PARTNERSHIP OPERATING UNDER FICTITIOUS BUSINESS NAME #2015-005320 FICTITIOUS BUSINESS NAME: La Casa de Los Alambres. The original statement of this fictitious business was filed in San Diego County on October 6, 2014 and assigned file number #2014-026544. Located at 777 Shadowridge Drive, Vista, CA. 92083.
the business: Rafamar Maintenance, located at Ave., Escondido, CA. Jose Rafael Beltran 816 W. 9th Ave.
State of California County of San Diego On 12/23/2014 before me, John Gabbour, Notary Public, personally appeared Rhazeal Izraheal Odu El who proved to me on the basis of satisfactory evidence to be the person whose name is subscribed to the within instrument, and acknowledged to me that he executed the same in his authorized capacity and that by his signature on the instrument the person for the entity upon behalf of which the person acted, executed th instrument. The Planning Division Director of the City of San Marcos has considered and does intend to APPROVE Director’s Permit 14-025 on April 3, 2015. Project No. : P14-0046 Case No. : DP 14-025 Applicant: Rock Church San Diego Request: A Director’s Permit to allow the continued operation of a public assembly facility in an existing 15,505 square foot suite in an existing industrial building in the Light Industrial (L-I) Zone of the Questhaven/La Costa Community Plan Area. Location of Property: 1740 La Costa Meadows Drive, Suite 200, more particularly described as: Parcel 4 of Parcel Map Number 16174 in the City of San Marcos, County of San Diego, State of California, filed in the Office of the County Recorder. Assessor’s Parcel Number: 223-030-76-00. NOTICE: • Appeal rights are available. Any interested person may appeal the decision of the Planning Division Director, provided the appeal fee is paid and a written appeal is submitted to the Planning Division Secretary within ten (10) days (due no later than 5:30 PM on Monday, April 13, 2015). The Planning Commission shall hear the appeal within forty (40) days after the filing of such appeal. Appeal fees shall be paid upon submittal. Said appeal shall be in writing and specify where there was an error in the decision of the Planning Division Director. Contact the Planning Division at 760-744-1050, extension 3233. • The City of San Marcos is committed to making its programs, services and activities accessible to individuals with disabilities. If you require accommodation to participate in any City program, service or activity, please contact the City Clerk’s office at 1 Civic Center Drive, San Marcos CA 92069, or call 760-744-1050, extension 3145. Further information about this notice can be obtained from Sean del Solar, Assistant Planner, at 760-744-1050 extension 3223, or sdelsolar@san-marcos.net. Phil Scollick, City Clerk, City of San Marcos. PD: 4/2/15. In 46 years in the law business I can say I have seen it all-Divorces, Adoptions, Business, Auto Accidents, Dog Bites, Defective Home Construction, Workers’ Compensation, Libel-Slander, etc. Small cases and huge-tragic quadriplegic injury cases (gun shot wounds). I have been a Judge in the Superior Court, Municipal Court, Workers’ Compensation, Arbitrator, Mediator, etc. I have taken care of thousands and thousands of satisfied clients. By the way, we believe in Jesus Christ. ...get lights au smile that p the d ay!